If you are still looking for yield, you haven't understood the problem. In the previous article we introduced the concept of the Liquidity Pyramid. In short, more liquid less risky assets sit at the bottom of an inverted pyramid whilst more risky, less liquid assets sit at the top of the pyramid. The creator of the Liquidity Pyramid, John Exter, placed Gold and Silver at the bottom of the liquidity pyramid because it is a form of wealth that has no counter party risk and for which there has always held value. 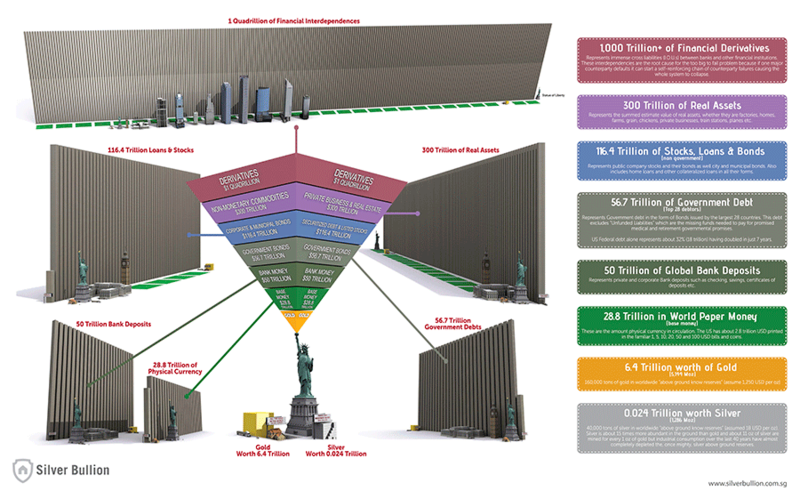 The Liquidity Pyramid remains relevant today. Almost all of the pyramid would be perfectly familiar to Exter in the 1950’s. Gold remains at the bottom, the Federal Reserve Note remains the world reserve currency and the US Treasury remains a safe haven for central banks and financial institutions around the world. Stocks and real estate and private business remain more risky and less liquid. The key difference between the world liquidity pyramid in Exter’s day is to be found at the top of the pyramid and what is considered ‘risky.’ In the 1950’s and 60’s, ‘Third World’ Debt was considered to be the most high risk investment one could make. How the world has changed since Exter’s day. We now only speak in terms of ‘developing’ markets. Indeed,’ Red China’ a country that was the grips of disastrous policies such as the Great Leap Forward and the Cultural Revolution had barely any financial system whatsoever, now has a 10 year government bond yielding a highly respectable 3.5% – as befitting the world’s second largest economy. Today, a whole new level has been added on top of the Liquidity Pyramid – derivatives. Whilst derivatives only featured on the public radar during the Great Financial Crisis of 2008, Exter would have of course been perfectly familiar with them. The Chicago Board of Trade had existed since 1848 as a futures and options trading center and provided the liquidity needed for an efficient financial market. By the 1960’s Exter was already becoming concerned that the US economy was losing its manufacturing base and becoming increasingly financialized. However, derivatives remained a relatively small and insignificant part of the overall world economy. The scale of the assets sizes is not easy to comprehend. That is why we must give thanks to Oto Godfrey who has leant his considerable graphic design skills to help us visualize the scale of the asset classes. If you zoom in to the graphic and look carefully, you will see that each ‘money tower’ is made of thousands of tiny $100 million blocks. From looking at the graphic, we can make the following comments and observations. Secondly, the size of the government bond and municipal bonds are massive. There appears to be a dichotomy in the markets – one buys bonds because one is not so optimistic about the future, you would rather lend the cash rather than use it. On the other hand, the yield on these bonds are at an all time low, despite the fact that the issuers of this debt are bankrupt. The yield on a 10 year Japanese Government Bond is currently 0.45%. It is our opinion that eventually, people will realize that government debt is not ‘risk free’ but is in fact highly risky. Yields going upwards in this government section are going to cause calamity in the asset classes above it. The stock market and the private business and real estate asset classes are huge and are largely a symptom of cheap money. Whilst there have been notorious examples of capital trying to burrow downwards from the stock market in 2000, then stocks and real estate in 2008, the overall trend for the last 35 years has been a massive growth in these asset classes – because of the correct expectation that money will always be cheaper. The top of the pyramid is the asset class that is the most astonishing. Whilst real estate and stocks represent real wealth because they provide rent and dividends, derivatives are simply bets and are a zero sum game. This is an asset class that barely existed until the early 1980’s and President Reagan’s deregulation of the financial markets. In short, financial institution A might bet financial institution B $1 billion that the price of say, coffee will go down at the end of the year. There will be a winner and a loser. The credit is created merely by signing the contract – this is why the notional value of derivatives would blot out the New York skyline. The sheer scale of the bets made often dwarfs the size of the financial institution making the bets – who might or might not then be bailed out. Deflation is the loss of confidence in free market money. Inflation is the loss of confidence in government money. This is perhaps the first time that the scale of the notional value of the derivatives asset class – 1 Quadrillion dollars, has ever been visualized. There is perhaps a tiny dim light in the collective minds of the free markets that credit cannot be created so easily without consequence. We are aware that this pyramid is of course unstable – as Exter intended it to appear. Should only a tiny increase in government bond yields occur, then much of the credit further up the pyramid will implode, setting off a chain reaction of derivative based disasters. Alternatively, should a tiny fraction of the derivatives market find itself without support, it will tear holes in the corporate bond, stock and real estate markets. The system is fragile to say the least. The free markets are rightfully nervous of this state of affairs and has twice in the last 15 years attempted to move their capital southwards. The next financial crisis will be the one in which even government bonds are no longer seen as safe havens. Under this hyper deflationary circumstance the Federal Reserve Note will have fantastic purchasing power. The will of the free markets, for now however, is counter balanced by the will of the financial elite. As we have seen on each occasion, base money is created out of thin air in order to reflate the rest of the pyramid. Eventually however, faith in paper money is always lost – which is why Exter placed gold at the bottom of the Liquidity Pyramid. In these circumstances, those tiny cube of gold and silver at the bottom will have claim to all of the wealth represented above. It is at this point that wealth is transferred to those who own paper assets to those who own bullion. All of the investment grade gold bullion in the world adds up to some 2 billion troy ounces ($2.5 Trillion at $1300 an oz.) For silver it is approximately 1 billion ($20 Billion at $20 an ounce.) When confidence is finally lost in paper money and specifically the Federal Reserve Note, these two tiny blocks of metal will be called upon to provide a value to all of assets higher up in the pyramid. This will be a wealth transfer on a massive scale.